Separation anxiety remedies for three legged Sparky the dog and other canines with stress, fear and worry when left alone. Nicholas Dodman’s “Good Old Dog” book is an authoritative guide to making your three legged dog’s senior years comfortable and healthy. 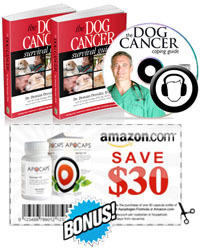 Animal Wellness Magazine helps you and your three legged Tripawd live a longer, healthier life. Power Paws Traction Socks for Dogs from Woodrow Wear Amazon Store help three legged dogs on slippery surfaces and protect hardwood floors.